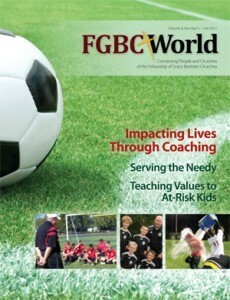 The Fall issue of FGBC World is now available online at fgbcworld.com. A companion to the print issue of the magazine, which was mailed last week, the online edition includes stories about Grace Brethren pastors who coach, the outreach efforts of one Indiana church to help the needy, and information about Grace in Action, one of the newest cooperating organizations in the Fellowship of Grace Brethren Churches. It also contains information about the people and congregations of the Fellowship of Grace Brethren Churches. FGBC World is an all-fellowship, all-Grace Brethren magazine published four times a year, with a special Conference edition that was released in early summer. In it you will find stories about Grace Brethren people around the world—from individuals who are on the front line of ministry to organizations that help impact lives for Jesus. The Winter 2012 issue of the magazine is now in production. News items may be submitted to lcgates@bmhbooks.com. Thanks for including grace in ACTION usa in this issue. I pray God will inspire many to help GiA "prepare children to become productive citizens" ~ with a Christian worldview, using the life skills curriculum. God Bless BMH!